A few weeks ago we found a pair of 1950s diner chairs in a local thrift shop. They were the right size to fit our vintage dinette table and we loved the curved legs and chrome handle on the top of the back. The chairs themselves were in much better shape than the original dinette chairs that came with the table and would take a lot less work to refurbish. The vinyl was very brittle and cracked in some places, but fortunatly I already had purchased some red "cracked ice" vinyl fabric that matched our table perfecty. A close-up of the back and chrome handle. Some of the splitting on the edge of the chair. 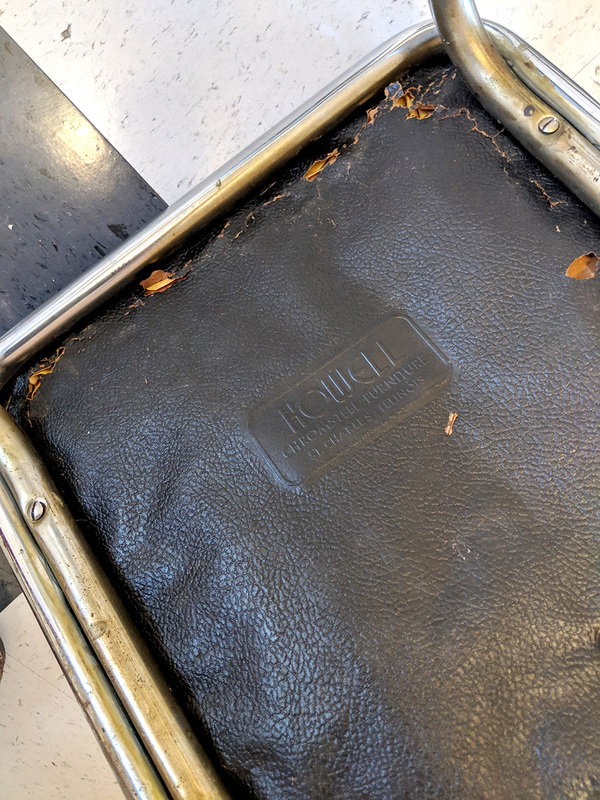 The bottom of the chair with the original “Howell” label. 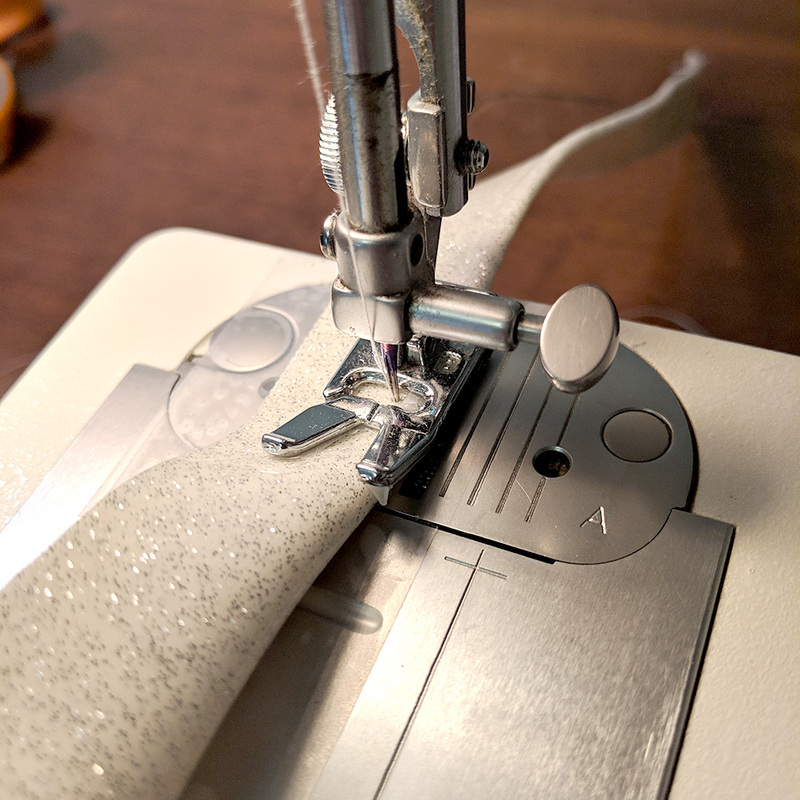 Optional: Teflon sewing machine presser foot (If you don’t have one of these, just line the bottom of the regular presser foot with tape, to help the foot glide better over the vinyl fabric. To start, I removed the seat, old vinyl and padding from the chairs. The back of my chairs could not be removed, but most on most, this would need to be removed as well. Using Simichrome Polish and fine steal wool, I shined up all the metal. Fortunately there was only a small amount of rust so it wasn’t difficult to get things looking great. The chair back with cardboard covers. I initially removed this to see how it was put together, but this should only be removed if it is in bad shape and needs to be replaced. 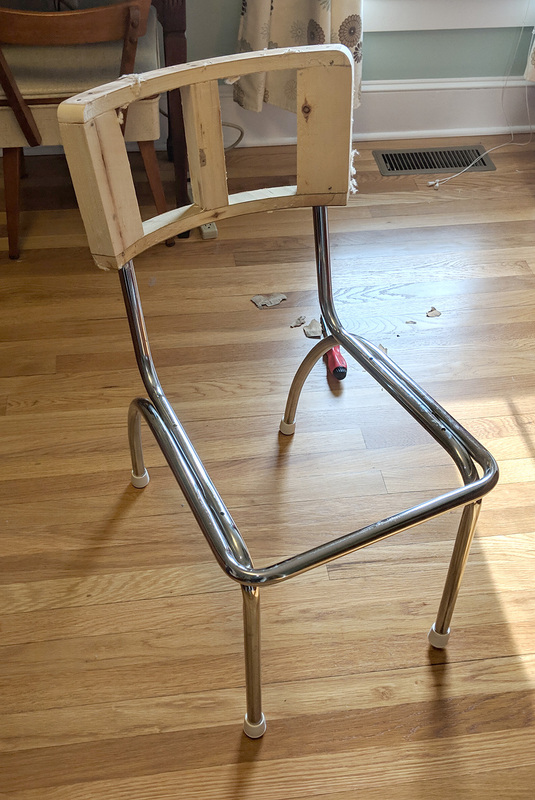 The skeleton of the chair. The back of the original chairs was covered with two pieces of vinyl, joined together in the middle and fitted over the wood frame. Using the original vinyl as a template, I attempted to make a new cover in the same way. Even after two attempts, I was unable to get the cover to fit properly. The new vinyl was thicker than the original and I just wasn’t able to stretch it enough to get all the wrinkles out. My first attempt at a chair back cover, using two pieces. My first cover did not fit well and I could not get the piping to line up properly. It was difficult for the cover to lay flat and to get all of the wrinkles out. The curved corners did not align with the frame. I decided to make the back cover out of three pieces rather than two. The new cover would be made up of a front, edge and back piece. I made pattern pieces by tracing to front, edge and back of the frame in paper. I then added 5/8” around all sides for the seam allowance. 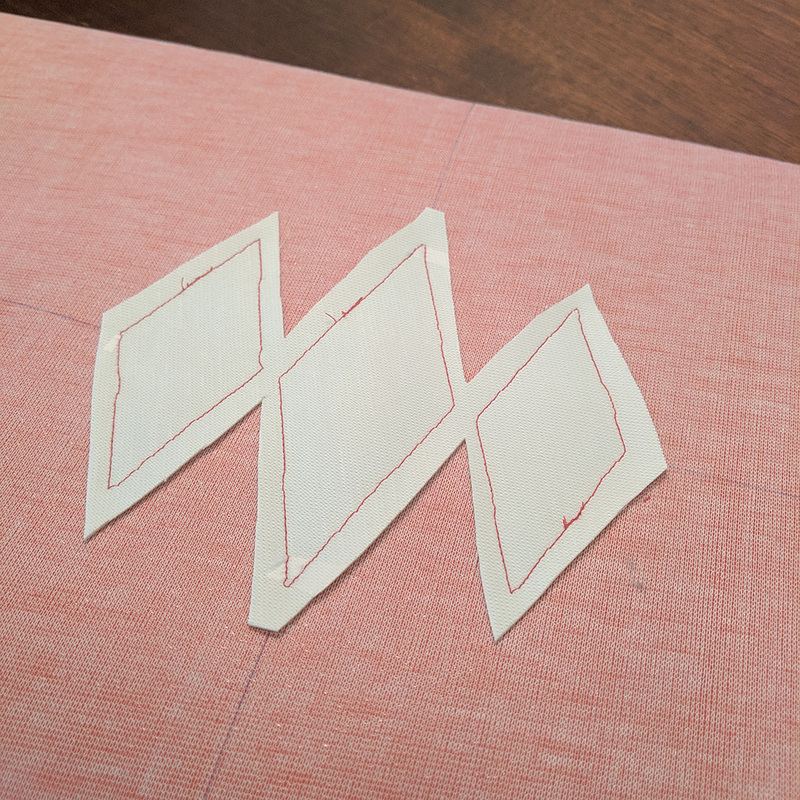 Before wasting any more of the good vinyl, I did a test run with cheaper material to make sure my new pattern would fit. This time things went much better so I moved on to the final version. I needed to make my own piping for the cover. To do this, I first cut a strip of sparkly white vinyl 37” long by 1.5” wide. Usually piping is made by added a cord in the middle of the strip of fabric, before sewing, to add bulk. Since the the vinyl fabric is already so thick, I didn’t think the cord was necessary, so I simply folded the strip in half and sewed it together, leaving 1/8” at the folded end. 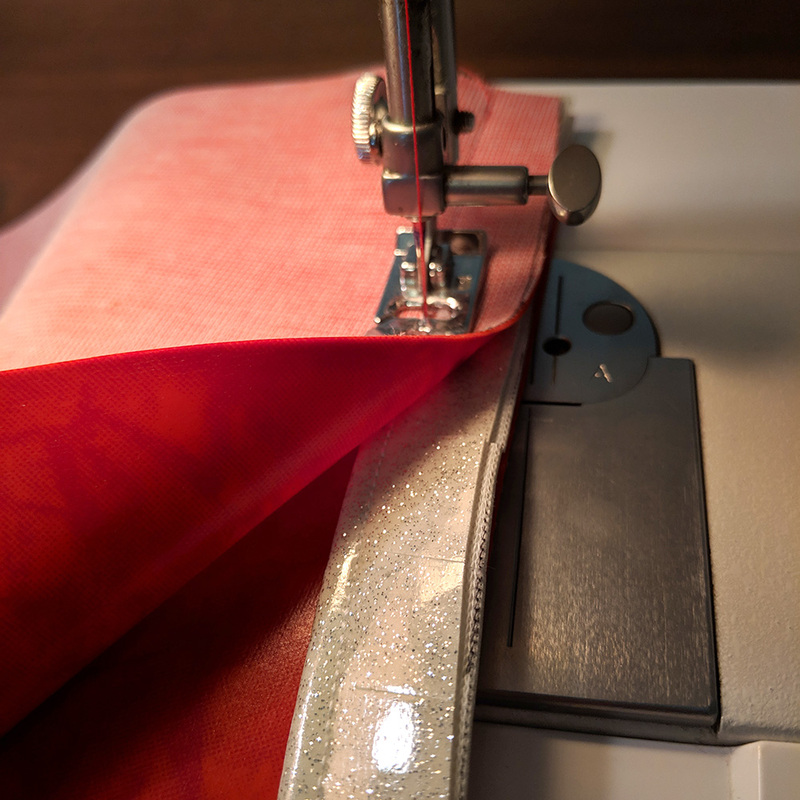 The piping was going to need to make some pretty tight turns at the corners, so to make it as flexible as possible, I clipped into the seam allowance the entire length of the strip. For the diamond pattern on the back of the chair, I drew it out on the back of the fabric and cut out the shapes using an X-acto knife. I then placed some white sparkly vinyl on the back side and top stitched it in place. 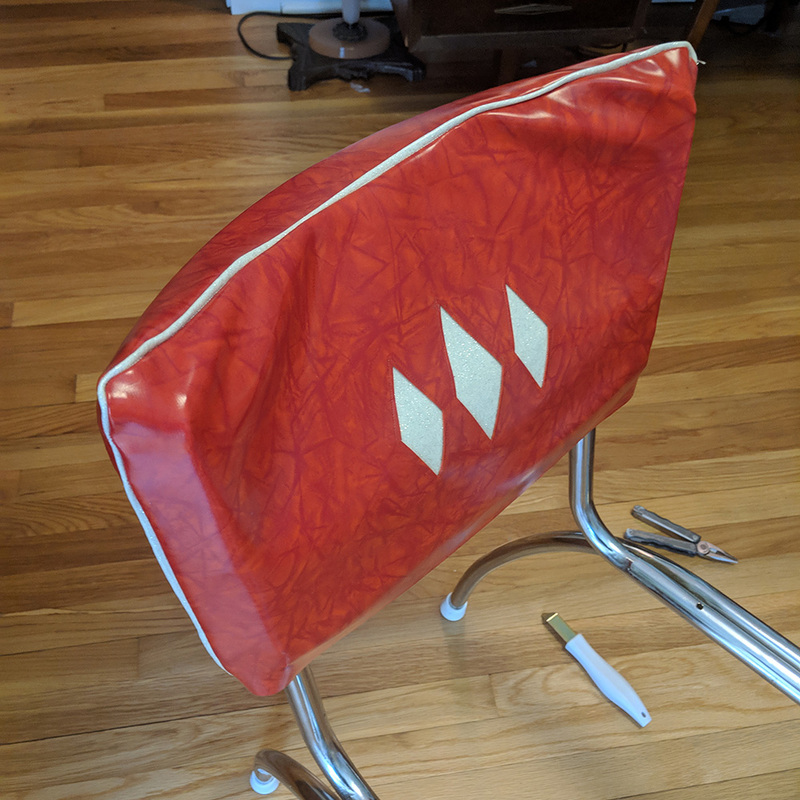 I cut way as the extra vinyl on the backside so it wouldn’t leave a square impression on the front side of the fabric when it was on the chair. The back of the fabric with the diamond pattnern drawn out. The pattern cut out of the main fabric. the back side of the diamonds with the contrasting fabric trimmed back. With all my pieces ready it was time to sew the front part of the cover to the edge piece. Since both pieces are curved in contrasting directions, I clipped into the curved portions of the pieces, to help them fit together properly. 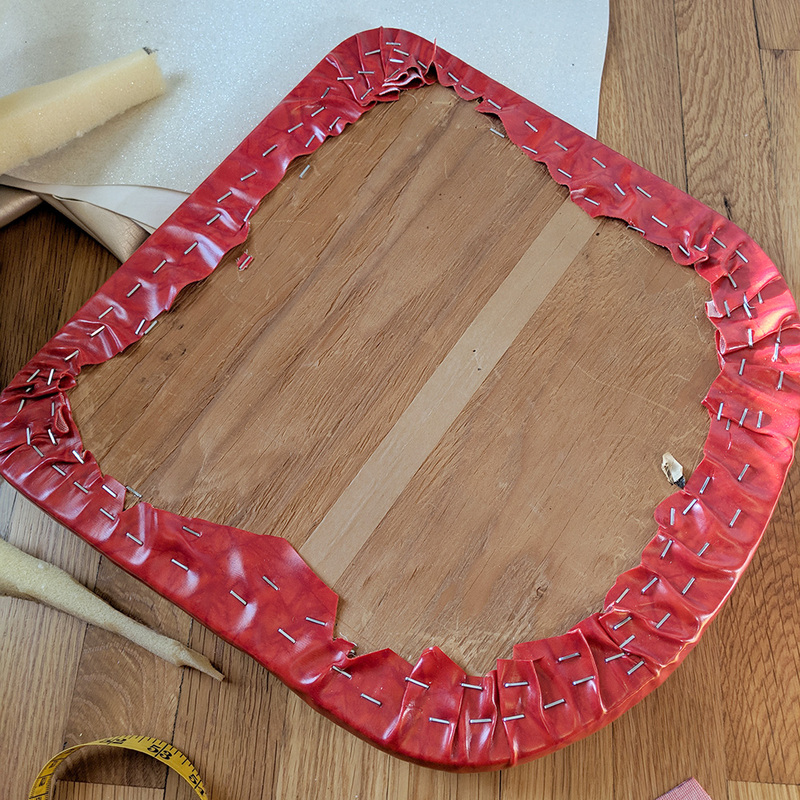 Sewing curves can be quite tricky so I drew another curved line 5/8” from the edge of the corners, to have a guide to follow while I was sewing. I then placed the piping between the front and sides pieces and sewed them all together. Since pins would leave little holes in the vinyl, I used quilting clips to keep the pieces in place as I sewed. I sewed the back piece to the edge piece, minus piping, to complete the cover. Before putting on the new cover, I replaced the old batting with new and slipped the cover in place. I then stretched the cover and stapled it in place on the underside, until it was tight and smooth. Happily this one fit much better than my original version and because of the addition of the edge piece, there was much less stretching and pulling needed for things to smooth out properly. New cotton batting on the chair. The underside of the back cover, stapled. For the seat cover, I added a new piece of foam to the top and covered it with a new piece of vinyl. Again, I stretched the vinyl until it was smooth and stapled it on the underside. 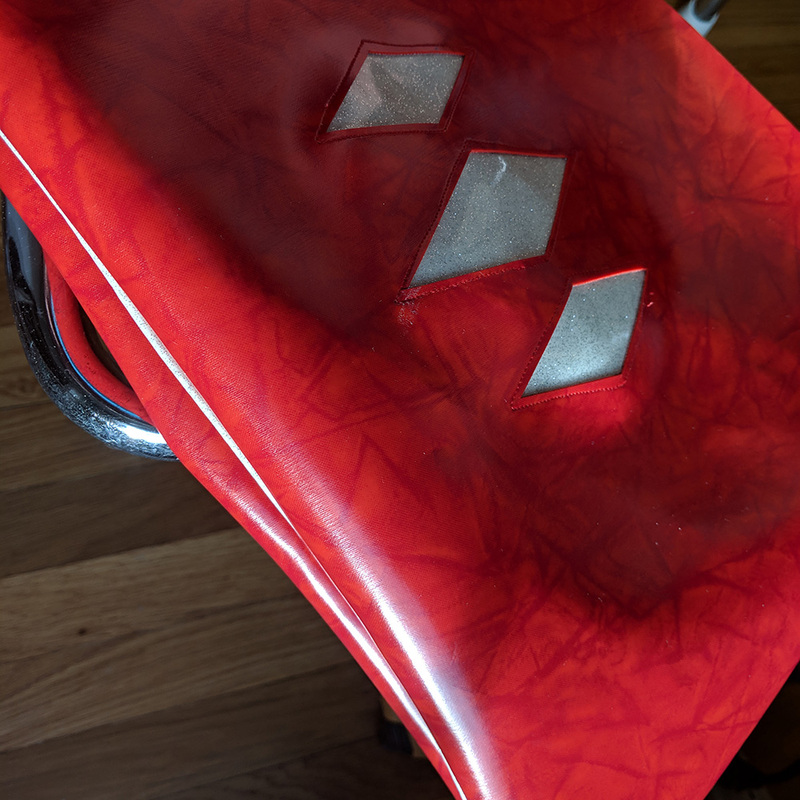 To help smooth the stubborn wrinkles on the corners of the seat, I used a hairdryer to heat and soften the vinyl so that it would stretch easier. This project was not without its problems and it took about 3 days to work out the issues and complete the two chairs. Despite all of that, I’m very happy with the way these chairs came out. The new “cracked ice” vinyl matches the dinette table perfectly.